Steve has been involved with SAR since 2001. 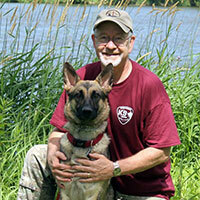 He is a founding member of WI K9 SOS, and served as Vice President and on the Board of Directors. Steve has earned his SARTechII certification with NASAR (National Association for Search & Rescue), as well as completed many other courses related to scent theory, search strategy, First Aid, K9 First Aid and incident command. 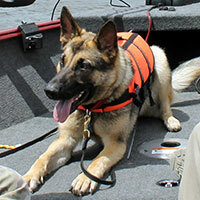 Steve is working with his second search dog who is certified in trailing and cadaver (land & water). K9 Eisa, 2013 – Present. L.E.T.S. certified in trailing and cadaver (land & water). Eisa, pronounced I’sa, (Xtra Vom Geistwesser) is a female German Shepherd Dog born in 2013. She is certified in trailing and cadaver (land & water) via L.E.T.S., Int'l. This multi-talented girl loves to tug, chase and retrieve balls. She seems to be in constant motion and is very verbal. She has “taught” our other dog, Jaeger, to howl and they both like to wake us up in the morning to their rendition of the wolves of Yellowstone.